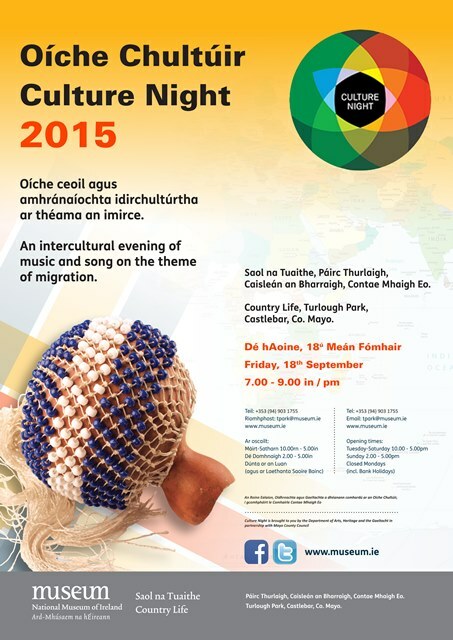 You are invited to a Oíche Chultúir / Culture Night at the National Museum of Ireland - Country Life on Dé hAoine, 18ú Mean Fómhair / Friday 18th September2015. Enjoy a fun intercultural evening of music and song on the theme of Migration with Irish and other musical traditions. Also view the Museum's most recent exhibition - Migrant Women : Shared Experiences. This unique exhibition explores migration and tells the stories of women who emigrated to New York in the 19th century and also of 8 women from around the world who immigrated to Mayo in recent times. No Booking Required. From 7.30-9 pm. Accessible and Suitable for all ages.